"JJ and A Racing Products" is the first company ever to build key-driven CNC machined billet aluminum ATV axle assemblies on a production basis. We released the product to the public on February 24th, 2003. A few other companies have since copied the design, but NO other company can copy our experience, our customer service or our machining quality !! Where a conventional ATV axle uses splines, the "JJ and A Racing Products" axle uses a key drive. Each hub has been split and is clamped on the axle shaft with a set of pinch bolts. This key drive and "pinched" hub is similar to that used on Shifter Carts and Jr. Dragsters. 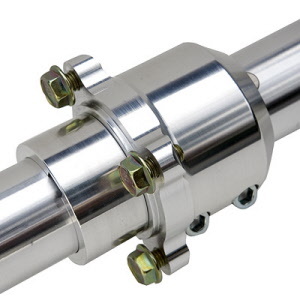 This configuration in an ATV axle has proven itself to be a bullet-proof and maintenance-free design for recreational dune riding, hill shooting and drag racing. Our 7075-T6 axle shafts are 40mm diameter from end-to-end. Our wheel hubs can be adjusted to set the desired tracking width. 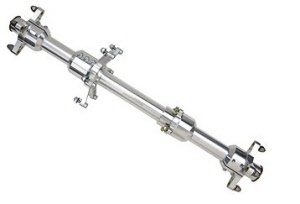 Our 26" DRAG axle is Gun-Drilled the entire length with a 19mm hole. Our 30" HILLSHOOTER axle is Gun-Drilled the entire length with a 19mm hole. Our 34" PLAY axle is solid. Shaft can be custom HARD-COATED light gold color. Hubs/Spacers can be custom HARD-COATED black. CONTACT US! LIFETIME WARRANTY - no questions asked. 100% USA materials and labor. This 26" long Banshee Gun-Drilled Drag Axle assembly weighs under 10 lbs! View of a Banshee brake hub. Our axle shaft has no "shear points"
New for 2008, our sprocket hubs now have Three Pinch Bolts clamping them to the shaft. We now have 3 different sprocket hub styles to choose from. Our 4-bolt Honda and 6-bolt Yamaha sprocket hubs come complete with plated grade-8 metric sprocket fasteners. 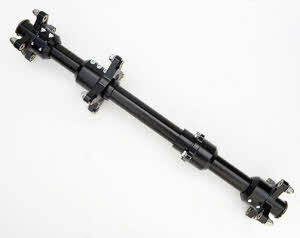 Gun-Drilled HILLSHOOTER axle is adjustable from 26" to 30" width. 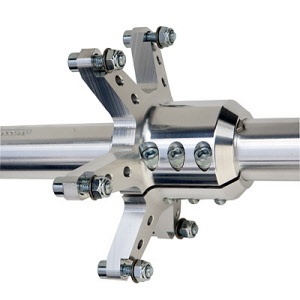 Solid PLAY axle is adjustable from 30" to 34" width. Custom Industrial Hard-Coating of Shafts available in Light Gold or Black. Custom Industrial Hard-Coating of Hubs and Spacers available in Black. Note: This is not just cosmetic color anodizing - this is a true industrial hard-coating process. 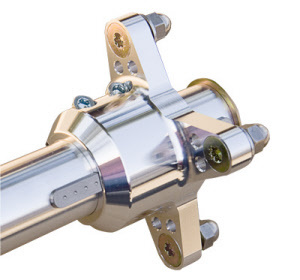 LIFETIME WARRANTY** on all components of all of our carrier-style ATV axle assemblies... no questions asked. Yes, this even includes the axle shaft! 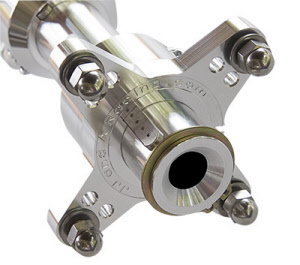 TRX250R application: Our TRX250R Honda axle will fit in to a stock Honda Bearing Carrier or any aftermarket billet carrier. TRX400EX application: Our TRX400EX Honda axle will fit in to a stock Honda Bearing Carrier or any aftermarket billet carrier. It does require the use of a Banshee brake rotor. We recommend a lightweight wave-style rotor. TRX450R application: Our TRX450R Honda axle will fit in to a stock Honda Bearing Carrier or any aftermarket billet carrier. 2004/2005 YFZ450 application: Our 2004/2005 YFZ450 axle will fit in to a stock 2004/2005 YFZ450 Bearing Carrier or any aftermarket billet carrier. 2006 and newer YFZ450 (Non-EFI, Steel Frame) application: Our 2006+ YFZ450 axle will fit in to a stock 2006+ YFZ450 Bearing Carrier or any aftermarket billet carrier. YFZ450R (EFI, Aluminum Frame) application: Our YFZ450R axle will fit in to a stock YFZ450R Bearing Carrier or any aftermarket billet carrier. 700 RAPTOR application: Our 700 Raptor axle will fit in to a stock 700 Raptor Bearing Carrier or any aftermarket billet carrier. LTR450 application: Our LTR450 Suzuki axle will fit in to a stock Suzuki Bearing Carrier or any aftermarket billet carrier. It does require the use of a TRX450R Sprocket and Brake Rotor. We recommend a lightweight wave-style rotor. We have these seals custom-made specifically for our aluminum axle application. If you have a JJ and A Racing axle in your 2006-2012 YFZ450 or Raptor 700, this is the correct dust seal set that will install directly in the 64mm bore of your OEM or OEM-style aftermarket bearing carrier. 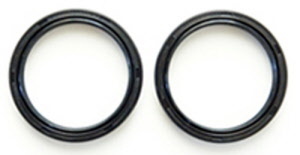 If you have a JJ and A Racing axle in your 2004/2005 YFZ450, this is the correct dust seal set that will install directly in the 62mm bore of your OEM or aftermarket bearing carrier. 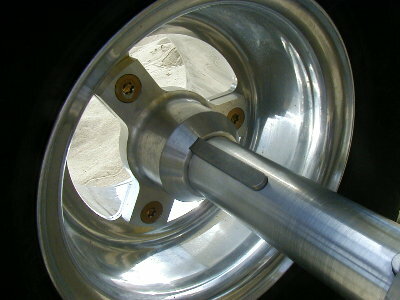 Inside view of 3-spoke rear wheel hub and 3-bolt rear wheel. Custom CNC Drag Cut 3-Bolt Rear Wheels to fit our 3-spoke rear wheel hubs. Wheels are 8" x 8" x .125" thick.